Instituted by order of Jozef Pilsudski in 1920, to honor Polish volunteers from Canada and U.S.A. who came to Poland (mostly via France) to defend the newly emerged Republic. In 1930 a smaller and better finished cross was introduced. 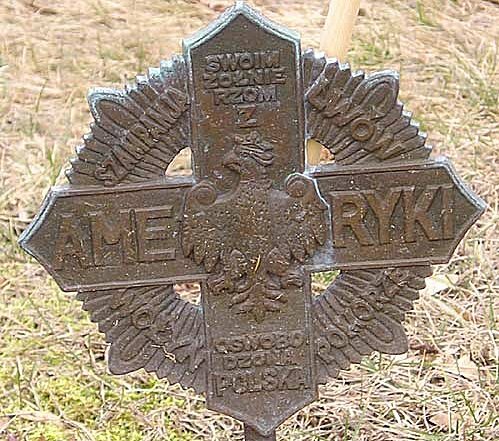 AME : RYKI : OSWOBO / DZONA / POLSKA (the liberated Poland to her soldiers from America). The reverse is blank. There is extensive information on Polish medals on this site (http://www.medals.lava.pl/pl/pl2a.htm), Unfortunately finding the email address of a person to contact was very difficult and when I finally found one, it bounced as invalid. 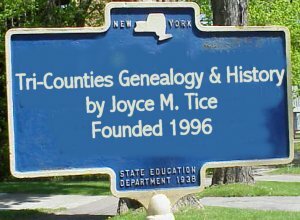 The site has not been updated since 2001. If anyone wants to wade through this or try to make contact with the person who knows about this subject , I'd appreciate it. Let me know what you find out. I was able to hone in on this using some of the words above in Google. Lwow - A city in Poland. Wolyn - Also a city in Poland. Now my weekly trips with Dad to the cemteries will have something new to keep our eyes open for. My Dad was on the RR til he retired and enjoyed your collection of RR markers. Here's one I got yesterday in the St Adalbert's Cemetery in Enfield CT yesterday. New? I couldn't seem to find it on your page. I don't have a clue what it's for. I bet I have dozens and dozens of markers in my gravestone pix - I'll keep a look out for different ones. I saw your site and the image of the Ameryki cross so I wanted to drop you a note with some information about it. Yes, the cross was used in the design of a Polish medal for soldiers who volunteered from America to fight in the Polish Army in France in WWI. The award is called the Cross for Americans. The names around it are of the places where they fought in the Polish-Soviet War. The Polish Army fought in France in WWI. After WWI was over, this army was eventually transported across Germany to Poland and became a critical part of the main Polish Army and contributed greatly in defeating the Bolsheviks in the Polish Soviet War of 1919-20. The image of the cross is/was widely used by the veteran’s organizations after the war. I have been working on a project to honor these great men and my website is at: http://www.HallersArmy.com It has become a bit of a personal passion of mine, I also collect items related to the subject. Please feel free to link to my site if any of your users wants to learn more about this subject.I would appreciate it if you didn’t list my email address online as I am trying to keep off the spammer’s lists. I have a contact form on my website for those trying to reach me.